Balloons are fun decorations at parties, but they have other uses, too. Dogs have a tendency to shed fur, and even though it's not their fault, it's still a mess. 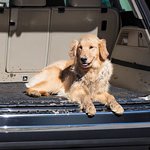 If you love your dog but hate when they leave fur behind on the upholstery, you'll love some of the tricks that we have for getting fur out of the car. Using a balloon is a simple technique to attract pet fur. Simply blow the balloon up, then rub it on your clothing to create an electrical charge. Then, rub the balloon around on the car seats where your dog has left fur behind. The static electricity should attract the fur on the upholstery. If you want another method, try putting water and fabric softener in a spray bottle. This trick is especially useful if the hairs are stuck in the fibers of the upholstery because the fabric softener will loosen them. Then, use a paper towel to wipe the fur away.